Twenty-five-year-old Christopher Meyer was born abroad and spent the first seven years of his life in Canada and Germany. When asked about his childhood, Meyer talks of bread from French bakeries, conversations with native Turks, and silky Italian ice cream. So, when his parents settled in semi-rural Indiana, there was some culture shock. But Meyer – who is legally blind – uses his travel experience to educate others about accessibility. Christopher Meyer founded Tactio Access when he was 24 years old. The company provides insight on accessibility and universal design, often working with the transportation and hospitality industries. In 2017, Meyer started an LLC, Tactio Access. The company – whose clients include IndyGo and the Indianapolis Airport Authority – offers insight on accessibility and universal design. 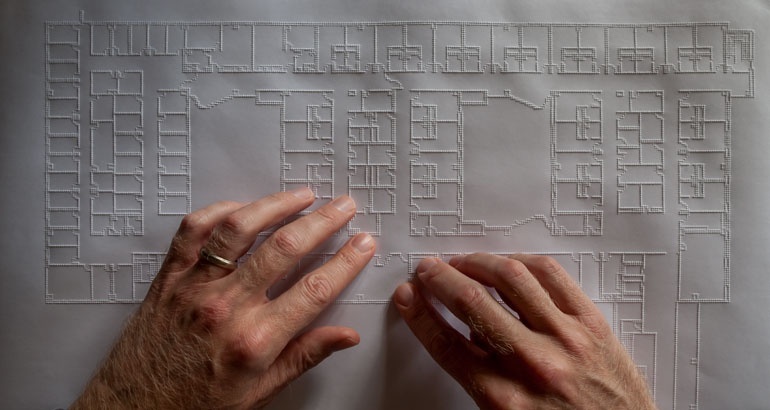 Tactio Access also makes tactile maps, which help individuals with visual impairments understand a building’s spatial layout. Meyer’s goal? Perfect the method, then sell the idea to other industries. Tactile paving is another way to help individuals who are visually impaired. These textured paving blocks originated in Japan and provide underfoot information at pedestrian crossings and other critical transportation areas (e.g. railway platforms). Normally sighted individuals may describe the blocks as “bumpy,” but for those with impaired sight, these tactile cues say, “You’re approaching a curb cut,” “There’s a staircase ahead,” and “Wait here for the train.” Tactile paving blocks often come in high-contrast colors and can also indicate the direction of travel. 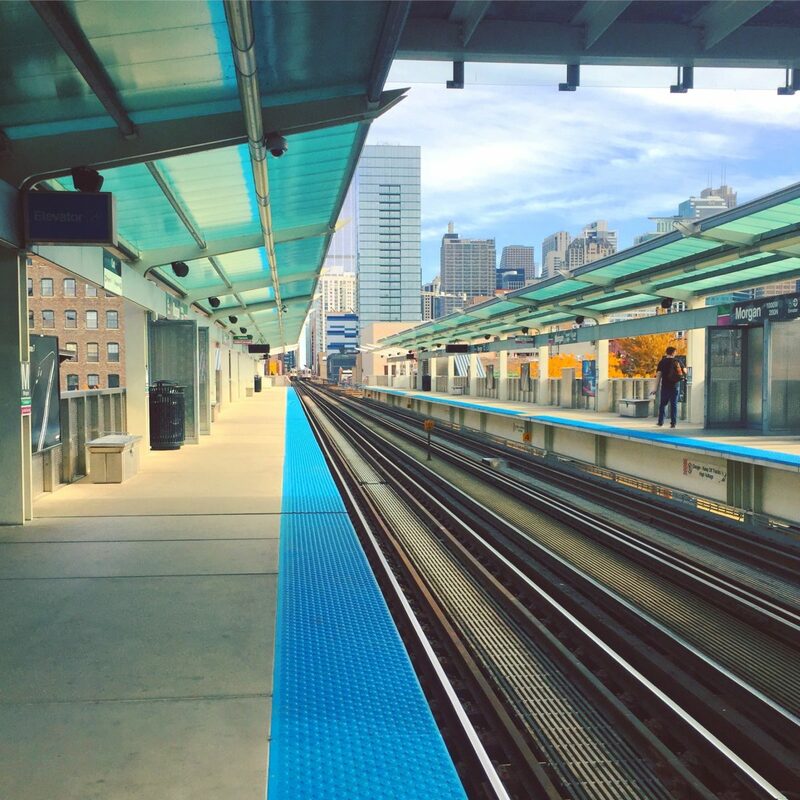 Colored tactile pavers, like those used on Chicago’s ‘L’ platforms, tell individuals with visual impairments where to walk and how to walk. // Photo by Anthony Ciancio, c/o Unsplash. Meyer notes that a lot of public spaces, including museums, are exploring Bluetooth technology. In Melbourne, Australia, a pilot program is transforming how individuals navigate the Southern Cross Railway Station. Through Bluetooth and BlindSquare – a free GPS app – users receive audio cues via their smartphones. The navigation system provides directions, real-time information, and advice such as, “Approaching four doors. The doors on the left are automated.” Meyer says these technologies help individuals understand where they are within a space, and also help them travel with confidence. That’s why Tactio Access works with central Indiana organizations to develop tactile experiences. Meyer believes in leveling the playing field, in creating as much of an opportunity to explore a space as someone who able-bodied. “It’s about having respect for people, about believing in autonomy for the end user,” he says. Meyer isn’t the only one creating tactile experiences. Architect Chris Downey also advocates for wayfinding and other critical tools for the blind. When Downey suddenly lost his sight in 2008, a social worker talked to him about “career alternatives.” But Downey decided against leaving the profession, and he established Architecture for the Blind instead. Today, he draws on his experience as an architect and helps create environments that are enriching for those with visual impairments, as well the normally sighted. Downey’s projects include the Duke University Eye Center Clinic, the Independent Living Resource Center of San Francisco, and the Blind Rehabilitation Center for the Department of Veterans Affairs. He also served as a consultant for San Francisco’s Salesforce Transit Center, a multimodal transit station that includes a 5.4-acre rooftop park and 118-foot-tall “light column” in the Grand Hall. Like all of Downey’s projects, the transit center integrates wayfinding through careful consideration of tactility, touch, smell, sound, temperature, and technology. After Chris Downey lost his sight in 2008, he continued to practice architecture. Today, he’s a consultant on designs for the blind and visually impaired, as well as public facilities. // Photo by Dan Fogg, c/o foggstudio. The ability to use public transportation – and use it with confidence – is a major part of universal design. 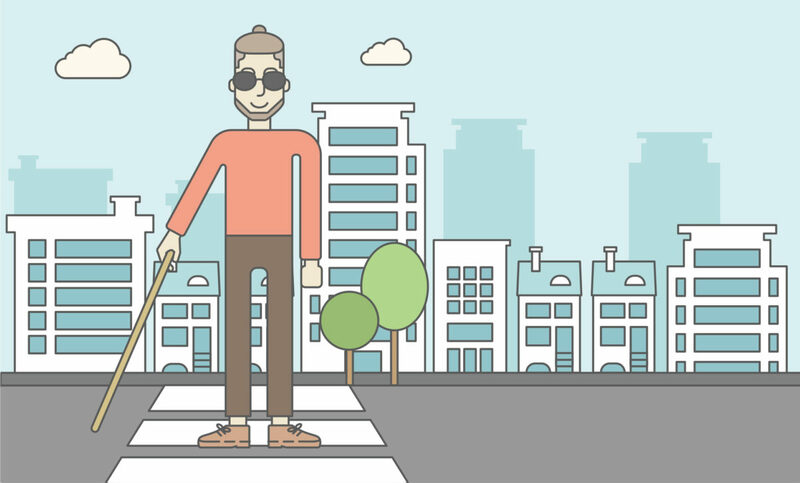 To remove the fear associated with navigating busy city streets, some organizations are working on projects that allow the blind to plan ahead. In San Francisco, Dr. Joshua Miele, a scientist at the Smith-Kettlewell Eye Research Institute, has partnered with LightHouse, an organization for the blind for which Downey serves as a board member. Together, they created accessible maps of every BART transit station. The maps – which are tactile, feature large print, and contain an audio component – allow individuals to plan a path of travel. Meyer would like to implement a similar system in Indianapolis, to complement the Julia M. Carson Transit Center. (He suggests adding a tactile overlay near each of the entrances.) Meyer also supports incorporating additional information at crosswalks and bus stops. Meyer proposes that placards be installed at a certain height at every intersection. The placards, written in Braille, would tell a pedestrian if the cross-street is one-way or two-way, if it’s perpendicular or off-set, and if it is necessary to wait for a crosswalk light to change. He says temporary signage or audio cues could also inform individuals of construction zones. To learn more about Tactio Access, tactile wayfinding, and designing for the blind, contact Christopher Meyer at reachbeyondaccess@gmail.com.